Logan embarks on a violent, bloody, finale stand as Hugh Jackman returns to the role of Wolverine, the iconic Mutant X-Man with the unbreakable adamantium skeleton, retractable claws, and incredible healing factor. Based loosely around the Marvel Comics classic Old Man Logan storyline by writer Mark Millar and artist Steve McNiven, Logan is tenth instalment in the X-Men film series from 20th Century Fox where Jackman originally debuted as Wolverine in X-Men (2000), its also the third Wolverine film after the less than favourable X-Men Origins: Wolverine (2009) and the far superior The Wolverine (2013). 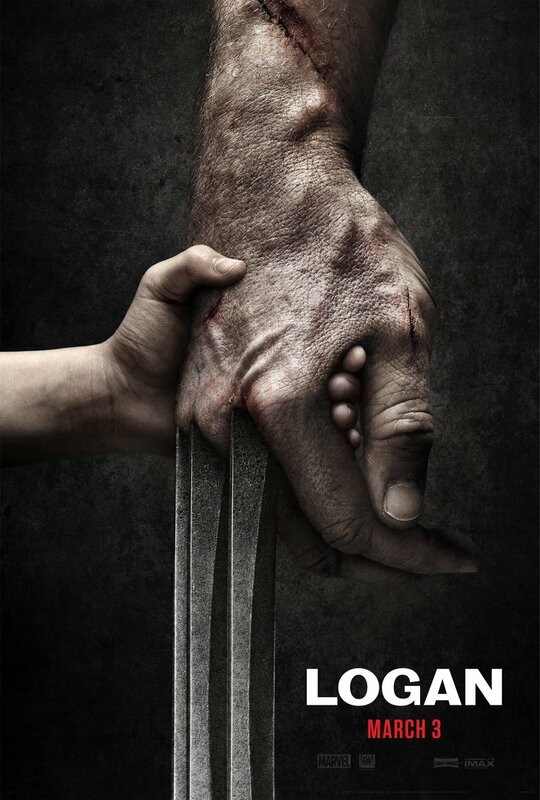 Set in 2029 where Mutantkind is on the brink of extinction, Logan (Hugh Jackman) finds our erstwhile hero now a shadow of his former self, ravaged by age, world weary, and slowly being poisoned by the Adamantiun in his body. Logan is carving out a meagre living as a chauffeur in El Paso, his only ally is the albino Mutant Caliban (Stephen Merchant), and together they care for the X-Men’s former leader Professor Charles Xavier (Patrick Stewart) – who is now suffering from a degenerative neurological condition – in a derelict hideout across the border in Mexico. Hugh Jackman give a powerful, emotive, and rip-roaring performances as the aging Mutant, who proves he’s still a force to be reckoned with even though his fabled healing factor isn’t exactly what it used to be. If anything, Jackman’s grizzled portrayal as the old man Logan is probably his finest turn yet in the iconic role that he‘s undeniably made his own since he first played it seventeen years ago. 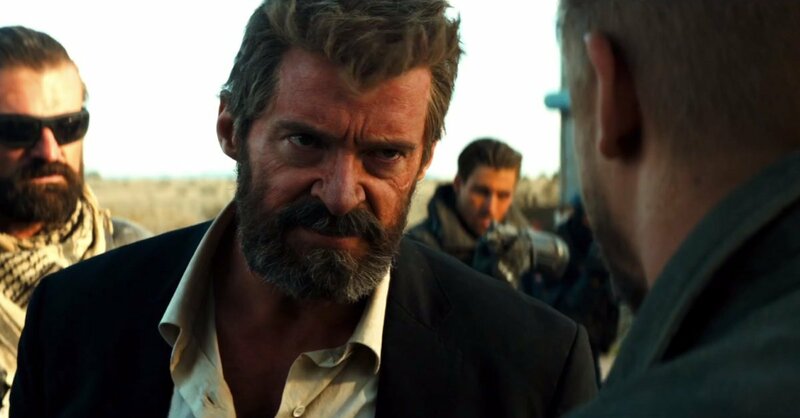 Despite Logan’s ragged and downtrodden appearance, Jackman’s brooding physical presence is still every bit as imposing as ever, and when those claws pop you better watch out bub!Just like 20th Century Fox’s smash-hit X-Men spin-off, Deadpool, Logan positively revels in its fifteen certificate. The violence is brutal, visceral, and unflinching, but it feels good to see Jackman portray Logan in a movie that finally allows Wolverine a chance to really cut loose against his enemies with the full-on savage fury that the character is so well-known for in the comics. Patrick Stewart is also on fine form as the ailing Professor X, and his scenes with Hugh Jackman are utterly sublime. 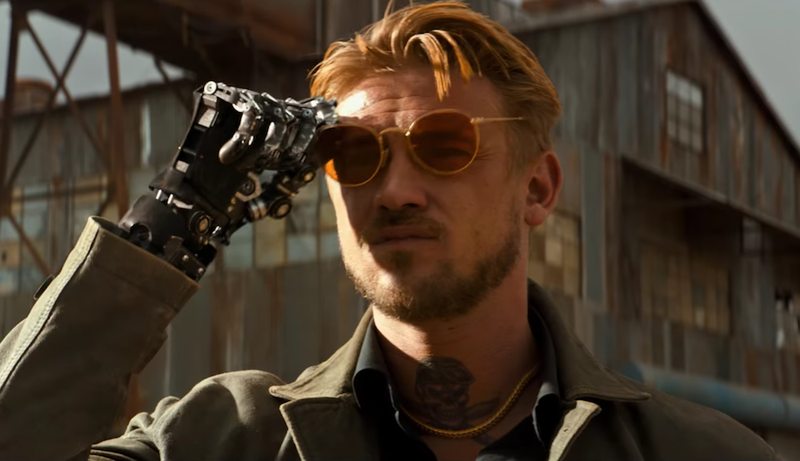 Charles is like a surrogate father figure to Logan now, the bond between them is as unbreakable as adamantium itself, and the combined tragedy of their circumstances coupled with the Professor’s terrifying psychic seizures brings added gravitas to many of Logan’s most poignant and powerful moments. Stephen Merchant is also excellent as the Mutant tracker Caliban, while Dafne Keen is a revelation as Logan’s young prodigy, the stoic, and sometimes frighteningly feral, Laura / X23. Richard E Grant is also good as the sinister Dr Zander Rice, the head of Transigen, and Boyd Holbrock is brilliant as the ruthless Reaver henchman Donald Pierce. 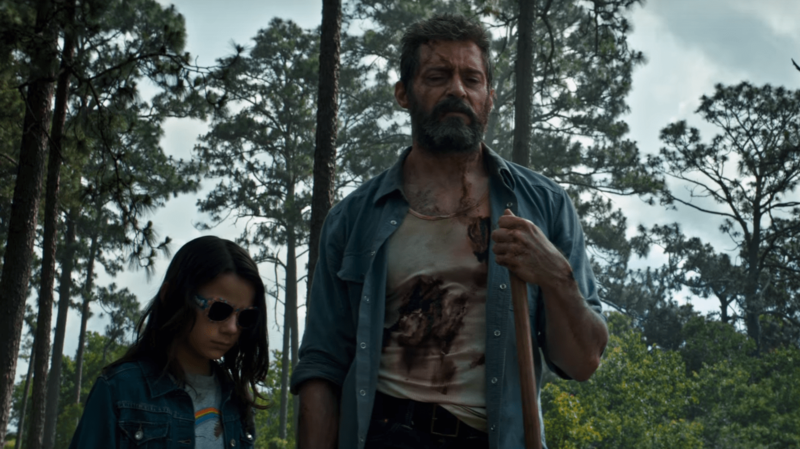 Directed by James Mangold, who also helmed 2013’s The Wolverine, Logan is a film that side-steps the usual superhero movie conventions to take us, much like the comic book storyline that inspired it, into much darker territory. 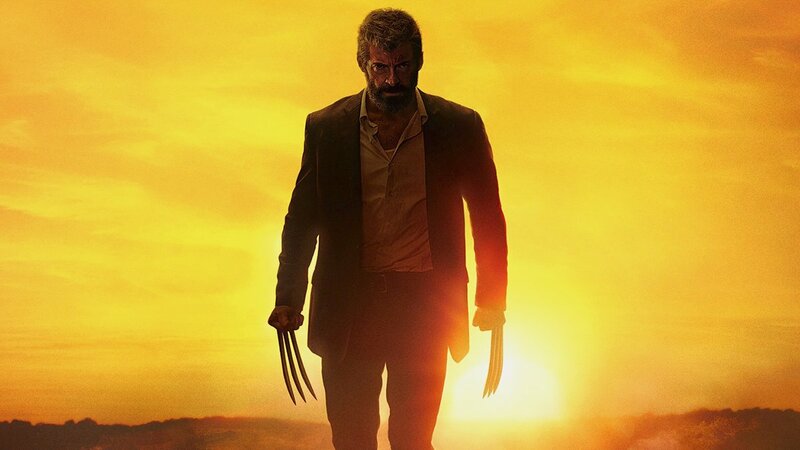 Logan is a no-nonsense, uber-violent, blend of western and road movie, tinged with a razor keen sense of humour, and a strong character driven plot. There are a few pacing issues, but nothing too major. Mangold also skilfully bends in nods to the previous X-Men films and comic book references – quite literally in one instance – for fans, but don’t expect colourful costumes, or huge CGI action set-pieces. Logan is a bleaker, far grittier experience, and it makes for a film that feels all the more richer as a result. Logan is the Wolverine movie we’ve always wanted. It takes us on an epic journey for what is, purportedly, Hugh Jackman’s final adventure as the ferocious Wolverine, and it brings the characters cinematic saga full circle. It’s beautifully filmed, the story is dark and compelling, and it races to a rampaging action-packed finale which in turn provides a brutally fitting and emotional swansong for Jackman’s time in the role. First Official Trailer For Logan released! Check out the first trailer Fox have released for Hugh Jackman’s Wolverine film, LOGAN. I think it looks great, very mean, moody, and apocalyptic looking! Starring Hugh Jackman as Logan, Patrick Stewart as Charles Xavier, Elizabeth Rodriguez , Boyd Holbrook, Stephen Merchant, Richard E. Grant and Eriq La Salle, Logan arrives in cinemas on March 3rd, 2017. 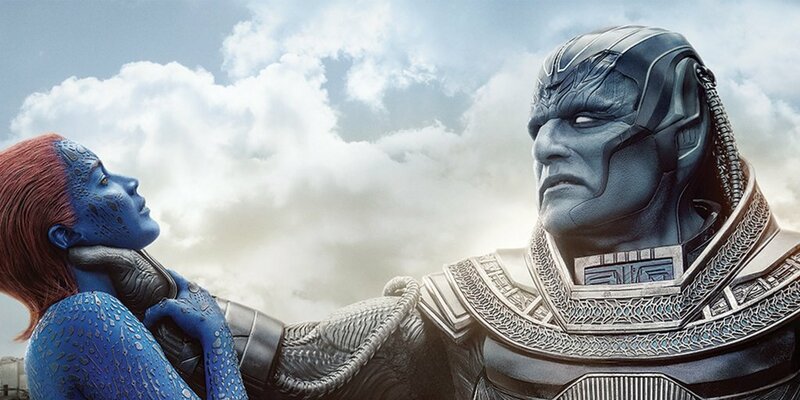 X-MEN: APOCALYPSE Final Trailer Released! New X-MEN: APOCALYPSE Final Trailer Released! Check out the final trailer for Brian Singer’s X-Men: Apocalypse, even more action in this one, and a there’s even special surprise appearance at the end! It looks brilliant, can’t wait for this movie! 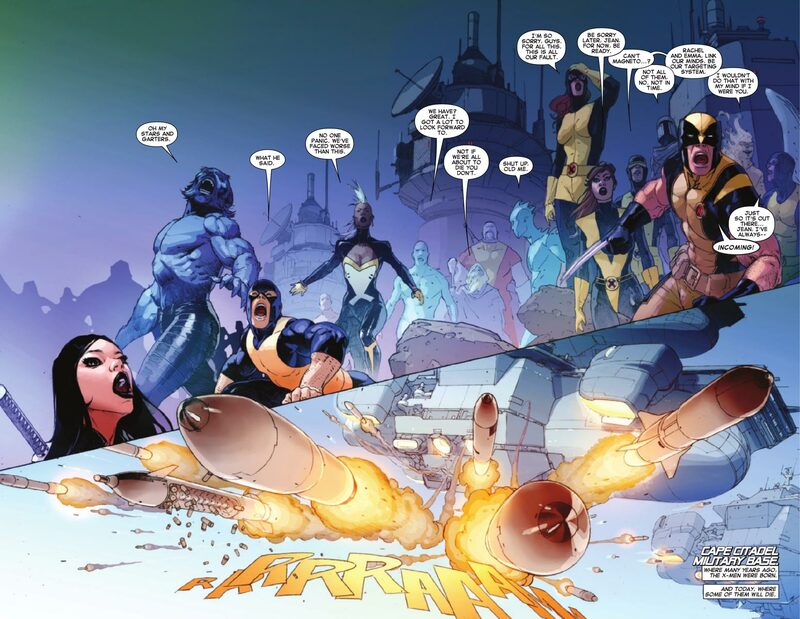 Faced with an onslaught of missiles launched by the S.H.I.E.L.D helleicarriers, all of the X-Men teams’ work together to fend off the attack, using every ounce of their combined powers to fight back as the Brotherhood version of the Beast urges them to all to join forces with them. But when he is suddenly cut down by blaster fire from some new arrivals – a group of Sentinels that have secretly been constructed by S.H.I.E.L.D – all hell breaks loose and the present day X-Men and future X-Men find themselves fighting a battle on two fronts. The battle is furious, casualties are high, and as the Brotherhood face defeat Jean “Xorn” Grey confronts Cyclops and Wolverine, blaming the Schism they caused that divided the X-Men for subverting the natural order of time, before fighting the original X-Men until her powers finally overload and she explodes! By the time Mira Hill arrives at the battlefield the Brotherhood has escaped and the X-Men have teleported back to the Jean Grey School. As they mourn their dead the X-Men must also form a response to S.H.I.E.L.D deploying Sentinels against them. 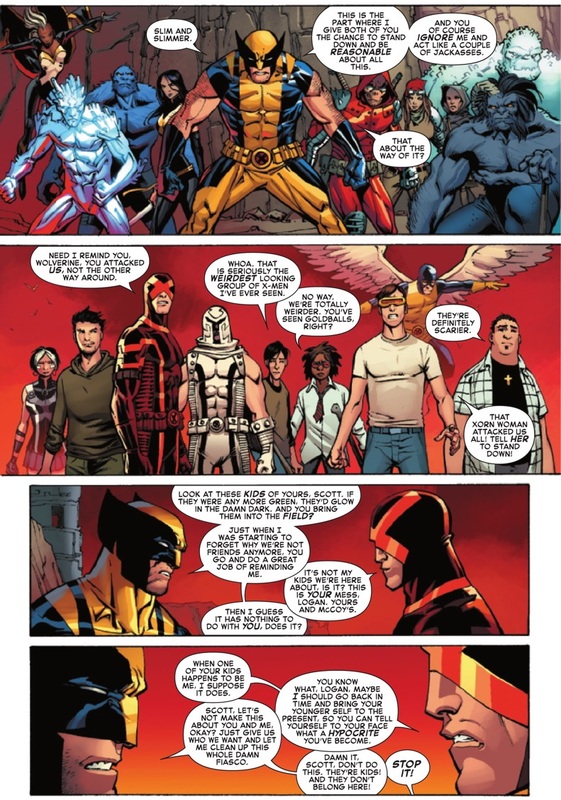 Despite everything that has happened, Wolverine and Cyclops are still unable to settle their differences, and their teams remain divided as the future X-Men prepare to return to their own time – though not everyone is going back to the future as Kymera opts to stay and hunt down the Brotherhood. 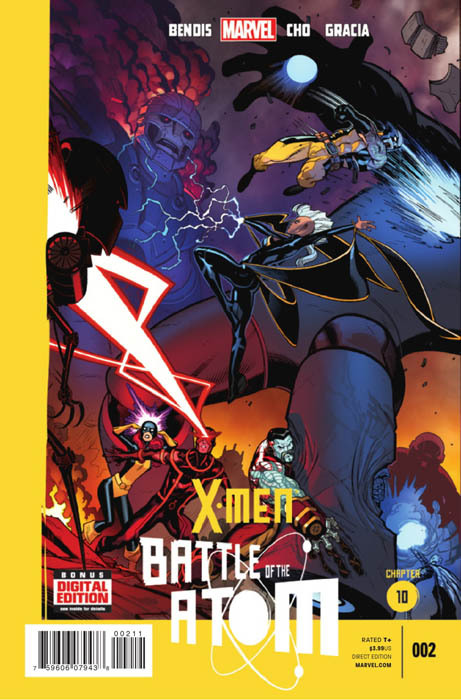 Battle of the Atom #2 brings this 50th anniversary crossover event for the X-Men to a close, with Jason Aaron tasked with wrapping everything up, with Brian Michael Bendis writing one of the issues four epilogues. After last issues terrific cliff-hanger Battle of the Atom #2 picks up the pace with a huge battle as the various teams of X-Men square off against the Brotherhood. The arrival of S.H.I.E.L.D’s secret supply of Sentinels is not an altogether unexpected twist; however, this is sure to have a significant impact on human-mutant relations in the future. 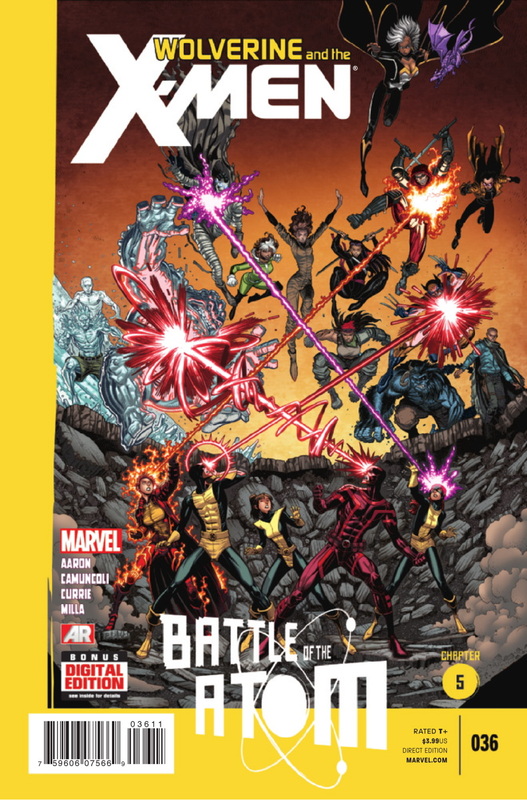 The climatic battle includes some brilliant action sequences, there are casualties, and I especially liked the part where the original X-Men took on Xorn. 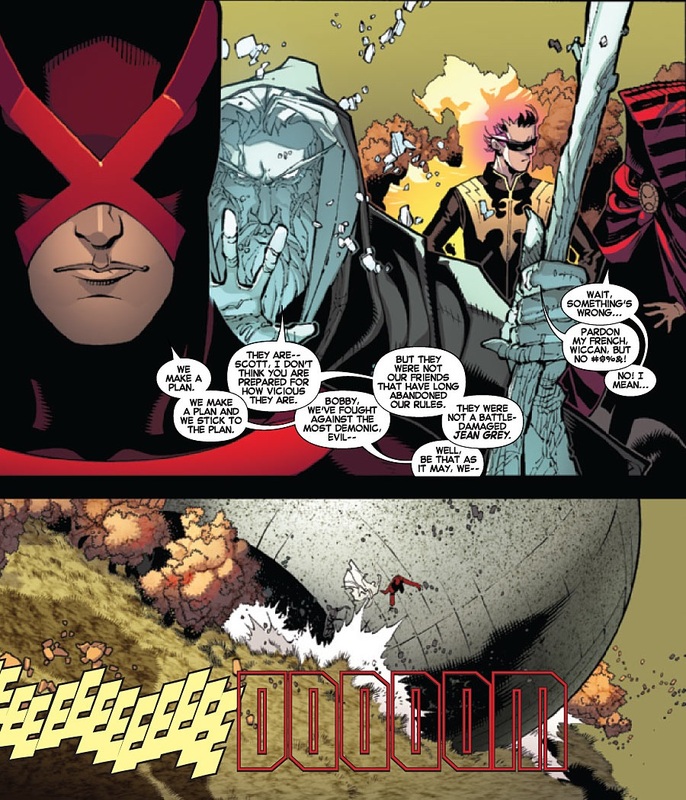 There was also a great showdown between Xorn and Phoenix Quentin Quire, where Jean taunts him about how the Phoenix force still whispers her name. While the battle does reach an explosive end, it all seems a little abrupt; giving way to a series of epilogues that shifts the emphasis towards setting up a plethora of future storylines – especially with the Brotherhood still at large. This somewhat uneven approach to Battle of the Atom #2 is also reflected in the artwork as well, as the main storyline has art by Esad Ribic and Giuseppe Camuncoli, with Andrew Currie and Tom Palmer on finishes. The four epilogues bring more by Camuncoli and Currie, along with Kris Anka, Chris Bachalo, and Stuart Immonen. Sadly the end result is not all that good; it all feels a little cobbled together, and not a patch on previous instalments. While Kitty’s decision to leave, followed by the original X-Men, in the final Epilogue by Brian Michael Bendis and Stuart Immonen was a big surprise, I was a little uncomfortable about how smug Cyclops seemed when he arrived with Magik to collect them – it seemed a little out of character. Epilogue two by Brian Wood, on the other hand, contains one of my favourite scenes of this entire crossover, as the adult Shogo prepares to say goodbye to Jubilee. It’s a brilliant moment for the characters, and I thought it was the real highlight of the issue. On the whole I have thoroughly enjoyed Battle of the Atom. I like how the story developed through each of the X-Titles involved in the crossover, there were some issues with constant recaps, but for the most part the story held together quiet well. Its just a shame that more time and care wasn’t put into making Battle of the Atom #2 more of an epic finale, rather than the last minute dash to the finish line that it turned out to be. A team of X-Men from the future arrive in the present day, demanding the original X-Men be sent back to he past. Wolverine and most of the X-Men agreed, but the young Jean and Scott went on the run, but eventually gave themselves up. The present day X-Men discover their visitors are really the future Brotherhood of Evil Mutants. With the school in lockdown the Brotherhood must face the combined might of the Uncanny X-Men and the real future X-Men. However, as the battle rages they prepare to forcibly send the young X-Men home, only to find that strange universal forces now prevent the teen mutants from going back. Jean “Xorn” Grey and Cyclops get up close and personal on the psychic plane, giving the Brotherhood the chance to escape in the Blackbird with the original X-Men. Wolverine is healed by Wiccan after being gutted by Raze, the son he will apparently have with Mystique, and meets up with the Uncanny X-Men and future X-Men in the lab. Meanwhile, the Brotherhood decide to switch to plan B after the Time Cube was unable to send the original X-Men back. Now that Deadpool is dead, and Xavier crippled and confined to a floating wheelchair, it seems that desperate measures are called for to complete their mission. Power dampeners prevent the captive teen X-Men from using their powers. 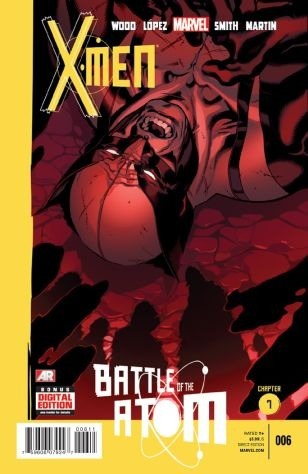 Scott asks Jean what she learned during her battle with Xorn, she reveals they must return home to save the future, and she is able to pick up enough of the Brotherhood’s thoughts to know they are being taken to Cape Citadel – the place where the original X-Men first fought against Magneto. Jason Arron makes this penultimate chapter of Battle of the Atom the most action packed yet, as Wolverine and the X-Men #37 brings all of the X-Teams, past, present, and future, together for a titanic showdown with the Brotherhood. I really like how the characters interact this issue, Jason Aaron includes some great character moments: with Cyclops and Wolverine begrudgingly setting aside their differences, we learn more about the Brotherhood’s plans, discover the truth about the Ice-Hulk, and Phoenix Quentin Quire meets his younger self. This issue is a lot of fun too, with Wolverine getting all the best lines, and we learn a lot more about the future X-Men as well. 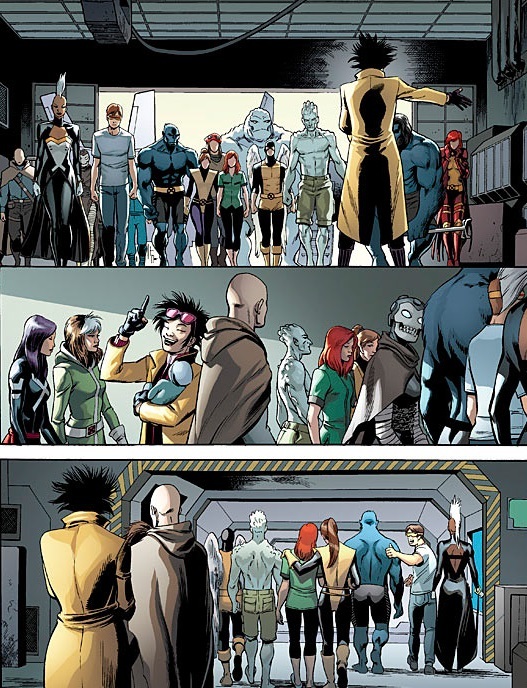 Although we are no closer to really understanding the bizarre paradox that seems to prevent the original X-Men from returning to the past, right now it is what young Jean’s battle with Xorn revealed that is perhaps more intriguing, especially when she reveals that if they stay one of them could be responsible for something terrible. However, this issues cliff-hanger could offer some clue, as Xorn resolves to show everyone what the future holds for the X-Men. Wolverine and the X-Men #37 features some great artwork by Giuseppe Camuncoli and finisher Andrew Currie, and vivid colors by Matt Milla. I really like the early scenes, where the X-Men are planning their next course of action, the detail given to the characters and their conversations is exceptional, which is also reflected in the later scenes in the Blackbird as the Brotherhood discuss Plan B and the original X-Men try to figure a way out of their predicament. In fact, by the time the X-Men and Brotherhood face each other at Cape Citadel, nearly every character in this issue has had a share of the limelight. 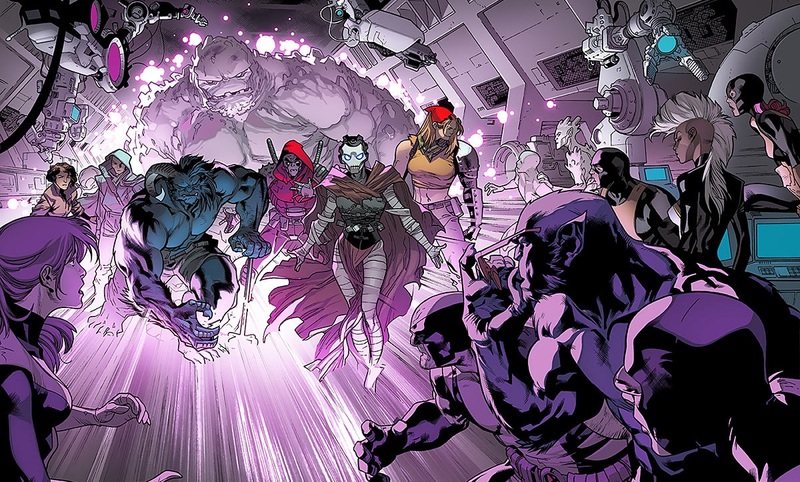 There’s also a spectacular double page spread near the end of the issue, where all the X-Men are fighting the Brotherhood, its absolutely brilliant, and that nail-biting final page will leave everyone diving for cover! Battle of the Atom is now hurtling towards a thrilling finale. Wolverine and the X-Men #37 continues the high standard set by previous instalments, Jason Arron delivers some excellent characterization, and Giuseppe and Camuncoli’s work really draws you into the action as the story races towards the final moments. After a team of X-Men from the future arrived, demanding that the Original X-Men return to the past, the young Jean and Scott went on the run. The present and future X-Men tracked them down, and eventually they agreed to return. Magik took young Iceman and Beast to the future to investigate and discovered the future X-Men were actually the evil Brotherhood from the future. Back at the Jean Grey school the Brotherhood attacked the X-Men, leaving Wolverine, who has just lost his healing factor, mortally wounded and bleeding out. Emerging from the wreckage of the school, Jubilee was surprised to discover that Sentinel X is the adult Shogo from the future. Now its falls to Cyclops and the Uncanny X-Men, together with the real X-Men of the future who have travelled back with Magik, Iceman, and Beast to help the X-Men fight the Brotherhood and save the original X-Men. 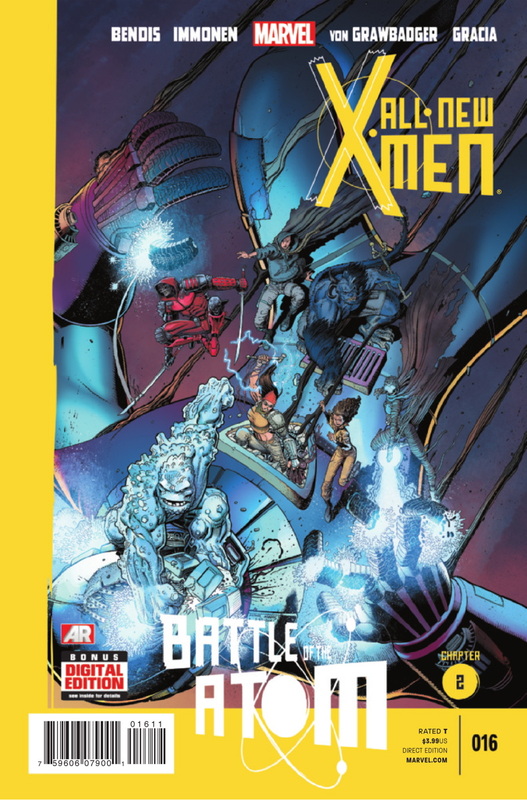 Uncanny X-Men #13 sees Brian Michael Bendis bringing the various teams of X-Men, past, present, and future together against the future Brotherhood, as part eight of Battle of the Atom turns the Jean Grey School of Higher Learning into a battleground. The Uncanny X-Men and future X-Men are forced to dive for cover when a piece of the north tower is lobbed at them, enabling the Brotherhood’s shape-shifter Raze (who mortally wounded Wolverine in their surprise attack) to capture young Iceman and Beast. 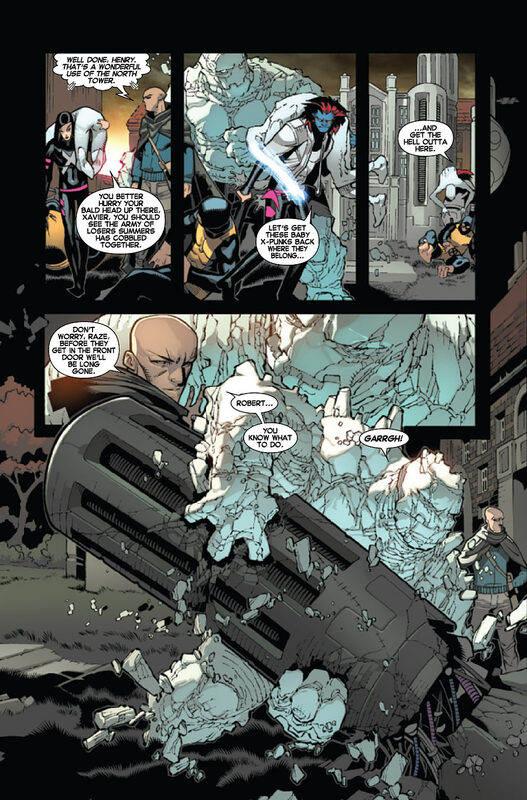 Xavier’s grandson orders the future Iceman to attack the X-Men again, Phoenix Quentin Quire steps in to deflect the debris thrown by the hulking Ice creature, leaving the X-Men free to reach the school. Magik and Colossus get inside first and have to fight their way past Molly and Deadpool. The Uncanny X-Men and future X-Men run into trouble outside the school, when Xavier commands Krakoa to swallow them whole, leaving the rest of the Brotherhood free to activate the Time Cube and send the original X-Men home. Chris Bachalo’s art for Uncanny X-Men #13 really captures the heightening sense of urgency as this time warping conflict escalates, with the fate of the original X-Men hanging in the balance, Bachalo delivers some terrific action set-pieces. His work is nicely complemented with inks by Time Townsend, Al Vey, Mark Irwin, Jamie Mendoza and Victor Olazaba, as well as the superb colors provided by Marte Gracia. This issue is full of spectacular, bone crunching showdowns, with Colossus and Magik in particular pulling no punches as they race to help the original X-Men. If your thought things have been complicated so far, you haven’t seen anything yet, as Brian Michael Bendis crams so much into part eight of Battle of the Atom, that its no wonder the Brotherhood’s plans hits a surprising snag. For those of us who have long wondered what effect the original X-Men’s presence in the present day might have on the time continuum, let along the paradox’s it could potentially cause, well Uncanny X-Men #13 goes some way to finally addressing those issues. We are also teased a few interesting points about Illyana’s involvement in events, after all, we know that she has already travelled into the future before in Battle of the Atom #1, and has long had her suspicions about these future X-Men. Her suspicions proved correct, as on her next trip into the future with Iceman and Beast, she learned from the “real” future X-Men that these mutants were actually the futures evil Brotherhood. In Uncanny X-Men #13 Molly hints about what was unleashed hen she sees Magik, and later mentions the Stark Tower / Baxter Building Wars as she battles Colossus. The adult Jean also has a few choice “spoilers” for Magik as she fends off Illyna’s attack in the lab. Whatever it all means, it seems possible that Illyna’s role in Battle of the Atom could now be more crucial than we first realised. 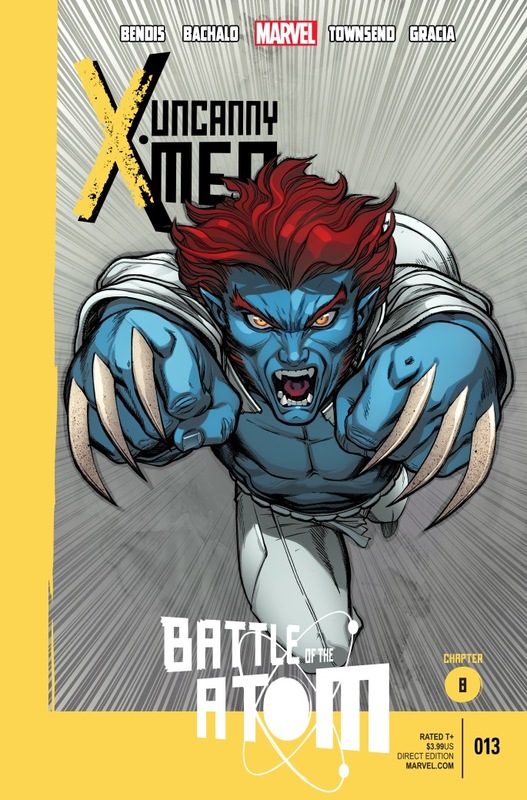 Uncanny X-Men #13 is an absolutely cracking instalment of Battle of the Atom. It may have taken a bit of a protracted route to get to this point, but we are now beginning to see the various plot threads coming together at last. Things are really building up to a titanic showdown, which together with this issues time twisting surprise, will leave you eager to find out how the X-Men and the Brotherhood will deal with this unexpected turn of events. After the young Cyclops was injured, temporarily erasing his adult self from existence, the modern-day X-Men decided to send the original X-Men back to their own time. The young Jean Grey is reluctant to go back, but a team of X-Men suddenly arrive from the future, and say the world is doomed if they don’t return. Jean and Scott turn to the adult Cyclops and the Uncanny X-Men for help, while the X-Men set out to bring them back. Magik, suspicious of the future X-Men, together with the young Iceman and Beast, travels to the future where they discover a pleasant future and meet a new team of X-Men. They reveal how the “future” X-Men that Magik and her fellow X-Men are helping, are not really X-Men anymore. The X-Men from this time period have not associated with them since the death of Alison Blaire, who was killed just after she became the first mutant president. Back in the present, the “future X-Men” have captured three of original five X-Men, and set about making preparations to send them back to their own time period. Part Seven of Battle of the Atom kicks off in X-Men #6 as the Blackbird and the Dove return to the Jean Grey School, where the X-Men are greeted by Jubilee and Roxanne. Xorn accompanies young Jean, Scott, and Warren to the Time Cube, but Wolverine suspicions soon prove correct when Xavier becomes enraged after learning that Magik, Beast, and Iceman have gone. With their cover blown, the bogus X-Men of the future attack. A surprise transformation catches Wolverine off guard and he is mortally wounded, while in Beast’s lab Xorn locks down the Time Cube and quickly secures the three original X-Men. So far, Battle of the Atom has been a hugely entertaining crossover event. The only real downside being that some issues have spent a lot of time recapping events, which sometimes made them feel like they were going over the same ground. Now that we are well past the halfway point, the mystery surrounding the time travelling X-Men from the future has taken a significant twist, and it looks like the present day X-Men are going to have one hell of a fight on their hands. Brian Wood’s X-Men #6 places Jubilee right at the heart of the action. There are some really fun moments with Shogo and some great action scenes when the X-Men are fighting the future X-Men, which leads to Jubilee taking a much more prominent role in Battle of the Atom than expected. When the “fake” X-Men from the future reveal their true colors, even Wolverine is caught off guard, and the psychic powers of the future Xavier and Xorn quickly overpower the rest, leaving only Wood’s team to oppose the future X-Men. Rachel battles against Xavier psychically, while Rogue gets a surprise when she tries to absorb the Ice-Hulk’s powers, which offers us some insight about this lumbering ice creature. Psylocke is also right in the thick of the action, while protecting baby Shogo at the same time, and later ends up fighting Deadpool. I thought baby Shogo’s “panic button” was a really fun device as well. There is a lot going on in this issue, even though the majority of the other X-Men are either unconscious or trapped in Hank’s lab. The art by David Lopez is excellent, every character is well defined, and his work is complemented by Cam Smith and Terry Pallot’s inks, with colors by Laura Martin and Matt Milla. X-Men #6 really captures the essence of Brian Woods X-Men, its one of the best instalment so far in Battle of the Atom, and the final scene is made all the more exciting by the reveal of who is inside Sentinel X.
Dr Henry McCoy brought the original X-Men to the present to try and reunite mutantkind. When young Scott Summers was almost killed, temporarily erasing his older self from reality, the X-Men argued whether or not they should send the young mutants home. Matters were complicated further by the arrival of a team of X-Men form the future, who insist the original X-Men must return to their own time. Jean Grey refuses and goes on the run with Scott; they evade the pursuing X-Men and seek help from the adult Cyclops and his Uncanny X-Men. Cyclops agrees to help but Emma Frost has contacted the X-Men who quickly arrive on Utopia. Confronted by the future version of Jean Grey, who wears a Xorn mask to control her abilities, the X-Men of the present and the future stand ready to fight to protect the past and save the future. With Xorn, the young Jean Grey, Emma Frost and the Cuckoos standing motionless as they battle psychically, the adult Scott Summers and his younger self begin to realise that Xorn is actually an older version of the young Jean Grey – the one who never returned to her own time and consequently grew up in the future. Faced with the X-Men from the future, Wolverine, and the present day-day X-Men, the Uncanny X-Men watch on as Logan offers the “slim and slimmer” incarnations of Cyclops a chance to be reasonable and stand down. Wolverine is quick to criticise the adult Cyclops for brining his young team into the field of battle, however Cyclops is having none of it, stating that he believes the responsibility for their conflict rests entirely with Logan and Hank McCoy. Wolverine and the X-Men #36 sees tensions between X-Men strained to breaking point as Battle of the Atom explodes into all-out-action. Jason Aaron keeps the action moving at a break-neck pace as standoff between Cyclops and Wolverine inevitably leads to conflict, with the future X-Men also becoming more aggressive, Storm tries to calm the situation and Beast admits he regrets bringing the original X-Men to the present. We also get a great scene where Kitty and Rachel discuss the situation with Kitty’s future self, with Rachel noting that she is no longer the leader she once knew. With some great art by Giuseppe Camuncoli and finisher Andrew Currie, along with colorists Matt Milla and Edgar Delgado, Wolverine and the X-Men #36 has some excellent fight scenes, with everyone getting a good slice of the action. However, it is the psychic combat with Xorn that is the real highlight this issue, and I really like the way Camuncoli portrays the raw power of this psychic battleground. We also get to see the toll this fight takes on the combatant’s physical bodies, as blood pours from their noses, and in Xorn’s case, from the corner of one eye of her mask as she fights Jean on the psychic plane. This issue features another eye-catching cover by Arthur Adams, with the X-Men attacking en masse as Cyclops and his younger self, together with Rachel and Kitty, stand their ground to protect Jean. Jason Aaron maintains the tone and style already established for this crossover event by Brian Michael Bendis, while adding just the right amount of humour to Wolverine and the X-Men #36 as each twist and turn of the plot unfolds. 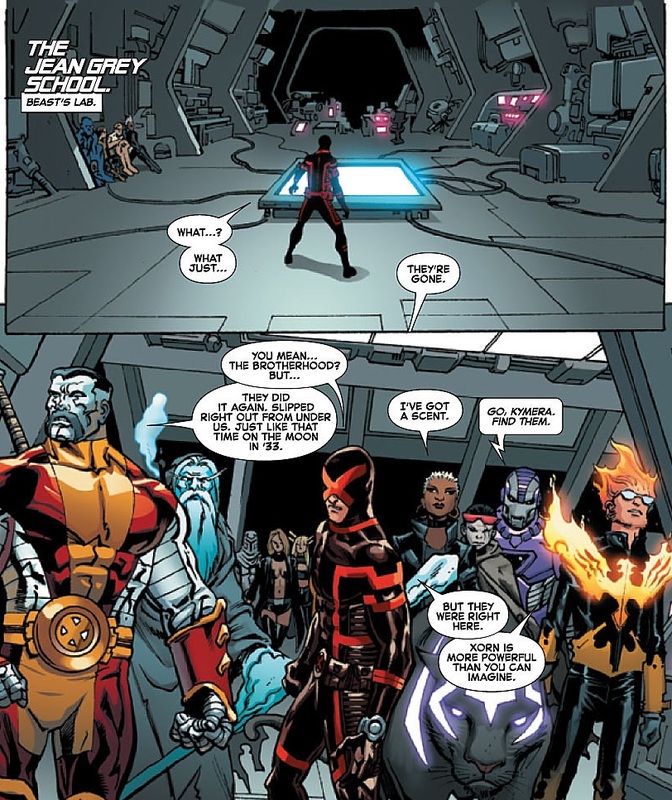 It’s good to see some of the other X-Men from the future taking a more active role in proceedings, with Deadpool giving a heartfelt – if not entirely honest – speech and the hulking Iceman going on the rampage. Wolverine and the X-Men #36 introduces some significant plot developments, decisions are made that will no doubt have a big impact as Battle of the Atom progresses, and the startling ending will leave you eager to find out what happens next. 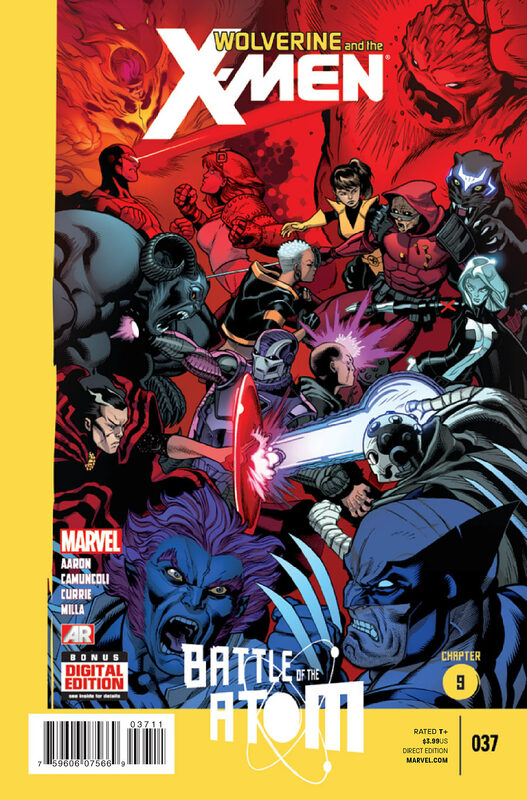 The second part of Battle of the Atom continues in All New X-Men #16 as Brian Michael Bendis juggles four teams of X-Men, quickly introducing Cyclops and his renegade team of Uncanny X-Men as Magneto assesses events in the field back at their hidden school. The action then switches to the Jean Grey School of Higher Learning, where a team of X-Men from the future have materialised. They claim the original X-Men should never have remained in the present and say they must return to their own time to avert a series of events unfolding in the future. It is here, as past, present, and future versions of the X-Men collide, that Brian Michael Bendis really excels. Bendis masterfully bridges the time spanning generation gap between the characters as they begin to interact. While the pace may be slowed by the dialogue and heavy exposition in places, it actually brings an added intensity to the scene, especially when the obligatory misunderstanding that always seems to accompany any larger gathering of X-Men ends in a free for all with everyone attempting to punch each others lights out. Jean and Scott take advantage of the distraction the fight provides to make a break for it. They take the Black Bird and go on the run from their teachers and friends, in a bid to escape a future that Jean so desperately wants to avoid. Jean feels that everyone is trying to manipulate everyone else, she doesn’t trust these future X-Men either as she cant read their minds, and she doesn’t want to go back to her time and give up this second chance at her life. I like the way that Wolverine uses his keen sense of smell to identify some of the X-Men from the future, especially when he realises he is talking to an older Kitty Pryde, who then embraces him. The mystery of the X-Men from the future is one of the best aspects of this storyline: the older Kitty Pryde is accompanied by an “old-as-dirt” Beast, Dead pool (now hooded and without his mask), and former Runaway Molly Hayes. There are also some key moments featuring Charles Xavier’s grandson, and a hilarious reaction to the hulking bruit of an Iceman by his younger self and present day counterpart, but it is the identity of the new Xorn that yields the biggest surprise of all in this issue. The art by Stuart Immonen, with inks by Wade Von Grawbadger and colors by Marte Garcia, looks as great as ever, no mean feat considering the number of characters in this issue. Its incredible how Immonen can bring so many characters to life in one scene. Each moment of Bendis’s intricate story and dialogue is perfectly brought to life by Immonen, the vast array of facial expressions together with the range of emotions the characters experience are all deftly handled, brining an added intensity to the this time travelling storyline. While this issue may be light on action, the interplay between the generations of X-Men is perfectly managed by Bendis. The surprise reveal at the end of All New X-Men #16 is brilliant, and with Scott Immonen’s spellbinding artwork, this 50th anniversary crossover event is already well on the way to becoming a real epic.